At the time of the American Civil War, U.S. silver coin became depreciated by 5 percent relative to gold. The situation caused American silver, mostly of the 25-cent and 50-cent denominations, to pour into Canada, where it was still received at full face value. Banks and post offices would not accept these coins, so retailers sold them at a discount to brokers, who in turn derived their livelihoods by selling the depreciated silver back to manufacturers and buyers of grain and cattle. Thus the cycle repeated and the "American silver nuisance" resulted in hardship to farmers, merchants and factory workers who had no choice but to accept their losses. 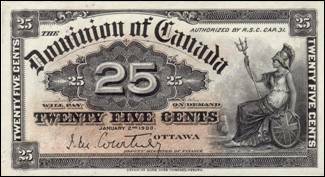 The government also suffered because the $1 and $2 Province of Canada notes, issued by the Dominion government after Confederation, were being crowded out of circulation. Sir Francis Hincks, minister of Finance in 1870, devised a three-pronged attack on the problem. The government would buy up the American silver at a discount progressing from 5 percent to 6 percent and export it, and then peg its legal value at an artificially low 80� on the dollar to ensure against its return to the country. To take its place, the first silver coins for the Dominion of Canada were ordered from the Royal Mint in London. 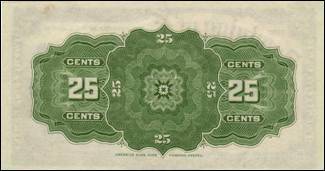 Finally as a temporary measure, 25-cent fractional notes were to be printed and issued to provide change while the new coinage was being prepared. 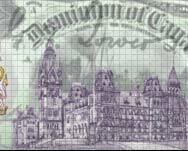 The initial issue of 1870 was composed of approximately 4,300,000 notes. These notes were not issued with serial numbers or check digits. While the 3rd group of these notes printed only made up a total of 300,000 notes, they are still the most common variety to this day. The initial "series A" notes are by far the rarest and command well over $100 for even poor examples. The banks were opposed to the introduction of paper "shinplasters," but the fact that they were redeemable in gold when presented in quantity went a long way toward making the fractional notes acceptable. The second issue was released in 1900 and were redesigned to feature a seated Britannia figure with trident and shield. Due to a loss of records covering the period from 1914 to 1921, the total number of 1900 25-cent notes issued is unavailable. However, of the remaining periods, over 5 million notes were issued. Many of these notes are still quite common today and decent enough examples can be had for less than $50. Hincks' manoeuvres were eminently successful. Enough American silver was repatriated to New York to saturate the markets there, and the remainder was shipped to England as bullion. There was one unexpected outcome, however. Far from being a temporary issue as planned, the fractional notes became popular with the public and persisted in circulation for the next 65 years. 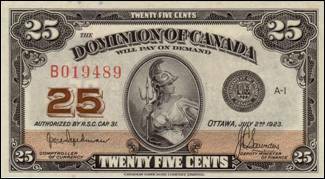 The third and final issue of Canada's 25-cent notes was released beginning in 1923 and continued until the Bank of Canada was created in 1935. This issue differed in that it was not only redesigned from its predecessors, but it is also the only one to feature serial numbers. A total of 7 million of these 1923-dated shinplasters were issued before the Bank of Canada took over. Many attribute the expression "shinplaster" to the use of fractional U.S. notes by soldiers of the Revolutionary War period to prevent their boots from chafing. The term was first used in Canada with reference to the merchants' scrip which appeared in abundance from 1837 to 1838. Subsequently it came to be applied to the 25-cent Dominion of Canada notes from the time of their first appearance in 1870.